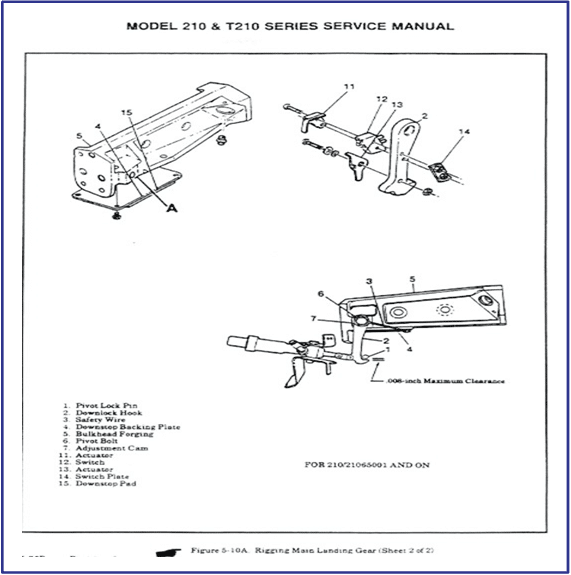 210 Landing Gear Rigging (K thru R Models) | Tennessee Aircraft Services, Inc.
Last but definitely not least in our series on rigging the Cessna 210 landing system is the 210N and 210R models. Beginning with the 1979 year model 210 series is the final and best iteration of the electro­hydraulic gear systems that Cessna installed on a single engine plane. It has the lowest parts count, the simplest operation, and the highest reliability. For those reasons, we don’t often get much practice with these versions. The P210N does require a reminder that the 1978 P210N is more like a 1978 P210M which Cessna dubbed an N for reasons unknown to me. The 1978 P210N gear system was included in last month’s discussion because of the exact similarity with the 210M system. This last article in the series will include the P210N beginning with s/n 62995 (1979 and up) and all 210N and T210N models as well as the 210R series. A couple of notes about changes in system operation might be in order here. The N & R model emergency hand pumps tap off the hydraulic system external to the power pack. This means there’s no residual fluid supply held in reserve specifically for use by the hand pump as has been available in some previous systems. Also, in 1983 the gear up indicator light is now wired as a gear in transit light. Gear up is indicated by no lights on at all. It’s far less annoying this way when flying at night. The gear pump motor control is determined solely by the system pressure switch and the nose gear squat switch. If the hydraulic pressure drops below 1000 p.s.i. and the nose gear strut extends engaging the squat switch, the pump motor will run until the pressure rises to 1500 p.s.i., regardless of the landing gear position. As a matter of fact, the pump/motor (a.k.a. power pack) gets no information about where the gear is. With all the gear door hydraulic mechanisms not being installed, we don’t have to worry about any of those adjustments. The nose gear does still have doors, but they are all mechanical so adjustment is very straight forward. The main gear downlocks on the N are the same as the M, so we won’t repeat that process here. For this simplistic system, the pressure switch would be a good place to start with adjustments, or at least a check. We rarely hear about pressure switches being out of spec, but that is likely due to the system pressure never being checked. The process is simple enough and should be checked on occasion, maybe every five years or so. The pressure switch operational check is as simple as installing a pressure gauge to the service port and using the emergency hand pump to generate hydraulic pressure. This allows a slow approach to see at what pressures the switch operates. 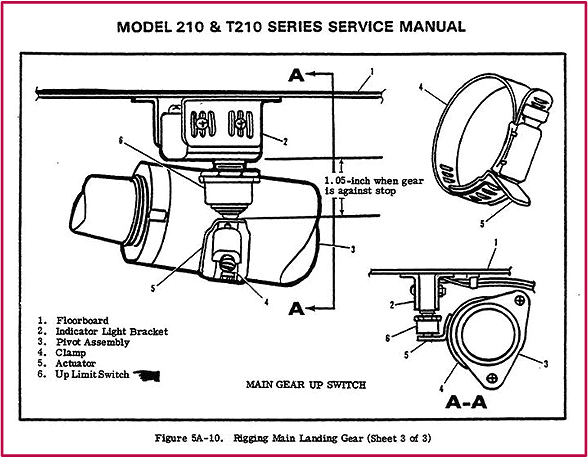 Adjustment is a matter of inserting specific washers under the switch spring and retesting. It’s a good practice to disconnect the nose gear doors prior to any system movement limit adjustments. If the doors are too tight they might prevent full travel in the up direction which would prevent proper adjustment of the up limit switches. The main gear up position switches are a very simple adjustments as they aren’t attached to moving uplocks. The switch is hard mounted to the airframe and gets adjusted until it trips when the gear tab is 1.05” from the bottom of the switch mount. There is a gear leg bumper pad that stops the upward movement of the gear leg. If that bumper is worn enough, the leg retracts too far and will damage the switch. Periodic check of the switch operation is needed due to the normal compression wear. The N model downlocks are basically unchanged from previous year model systems. 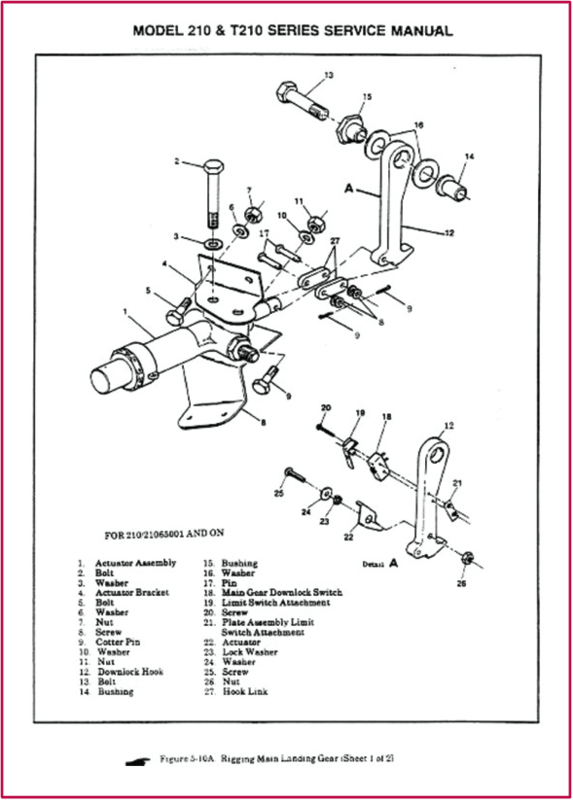 The special gauges are needed for adjustment and the process is the same. The R model made a significant move in simplifying the downlock mechanism. Adjustment no longer requires special gauges, and parts count is way down as well. This is a total redesign of the main gear down lock. Gone are most of the components that cause so much trouble during rigging of the older models. 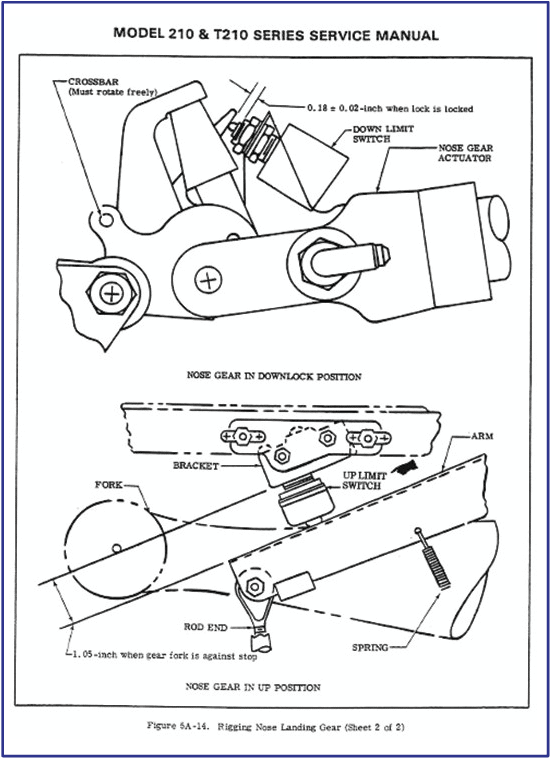 Another view of the main gear down lock showing the maximum clearance allowed at the hock connection with the gear leg pin. Nose gear rigging is the same on the N and the R. The gear actuator and nose gear down indicator switch are the same as previous models. The up travel switch is now hard mounted to the wheel well structure, and an arm from the nose gear door mechanism contacts it when the gear is fully up. Adjustment is straightforward. 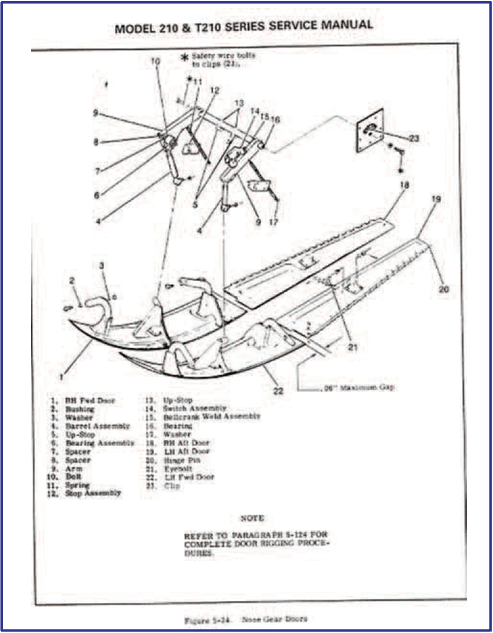 Be sure the nose strut maximum extension isn’t exceeded, or tire contact with the forward wheel well will inhibit travel and stress the lower trunnion. As with all models, nose gear door rigging is last on the adjustment list. We normally adjust one door at a time and start with it having a closed position that is at least 1⁄4 inch out. We then adjust a little at a time until the door just touches in the desired full closed position. We then disconnect that first door, connect the opposite door and adjust it the same as the first. This ensures the doors don’t limit proper gear operation. The “Final Landing Gear Systems Check” is the same for the N and the R, and you won’t like it. It’s a combination of operational check and air purging. The first step is to cycle the gear through twenty­five complete cycles (yes, I said twenty-­five) using the emergency hand pump. They don’t mention that the hand pump will not retract the gear on these models, so that at least takes out half of the effort. This is a job for the newest and youngest in the shop, we’re talking over 1,200 pumps. Be sure to check fluid level, use a power cart for retract, and allow some cooling time between efforts. Another part of the Final Landing Gear System Check is to stop the gear up sequence just after the left downlock retracts, and then move the select lever back to the down position. The system should properly extend the gear and lock the downlocks. This may seem like an odd test, but it’s very telling to the proper adjustment and operation of the downlocks. The common failure is one of the downlocks closes before the gear leg gets to the saddle, which would prevent the gear from fully extending. Last in the adjustment process is the throttle switch. Testing the full operation and activation point can only be accurately performed in flight, so we want everything else to be operating correctly. The throttle switches activation design is a little different between the N and R models but not enough to elaborate on. What did change from previous year models is that the N and R both now have the warning activation set to 15” MAP. The inflight test procedure is unchanged. When talking to mechanics and aircraft owners unfamiliar with the 210, the prevailing comment from them is about the problematic landing gear system. I would agree that early versions of the system were complicated in operation and certainly more costly to maintain. However, I’ve found the most common denominator in the gear troubles is the lack of training and understanding on the part of the maintenance providers. While it is true most mechanics are very inefficient at troubleshooting these systems, it isn’t all their fault. Troubleshooting the system isn’t difficult in most situations, but only if you know it well. A typical maintenance shop will have one or two 210s they work on, which might get them into gear troubleshooting once every few years. It just isn’t realistic to expect them to be an expert on it. That’s another reason to be a CPA member, access to help for you and your mechanic when these rare technical problems pop up. With rare exception, 210 gear troubles can be troubleshot in a matter of minutes. Difficult issues might take an hour or so to isolate. Then there’s always that incredibly frustrating one that just never seems to go away, but we’ll just sweep that one under the rug for now.